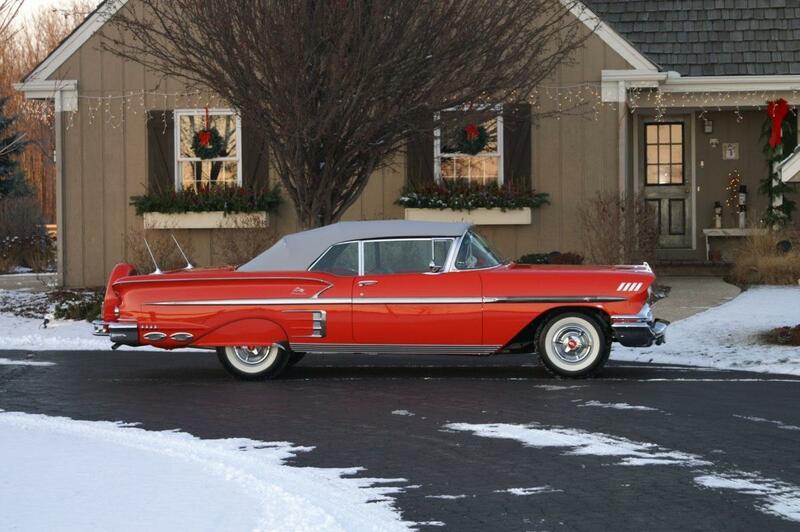 1958 was the first year for the lavishly equipped Impala trim package. 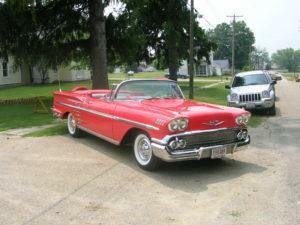 It was only available on the Bel Air in two body styles, convertible and sport coupe. The Impala script, insignia and crossed flag emblems on the front of the hood, ribbed body sill panels, large chrome air scoops ahead of the rear wheels on the fenders, a competition style deep two spoke steering wheel with Impala medallions, and Impala script on the dash along with six taillights gave it a luxuriously sporty look that was distinct from other Chevrolets. A rear radio speaker grill was standard. New twin driving lights were a first as was the new wrap around windshield. 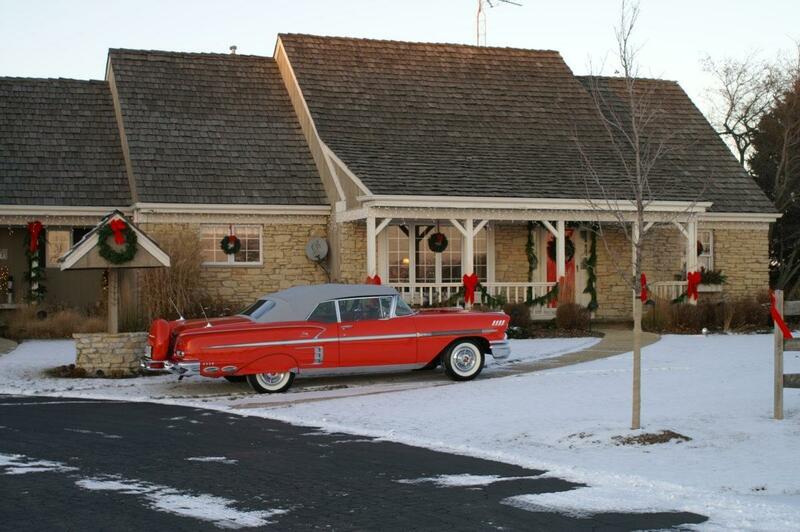 The 1800 series V8 Bel Air Impala Convertible displayed in the Ken Nagel collection started life in the now shuttered Janesville Wisconsin assembly plant. Chevrolet made a goodly number of Impala convertibles in ’58 but few were as highly optioned as this 348 Cu In 280 HP Tri Power (three two barrel carburetors) concours quality example. Kens stunning Impala Convertible features some unique and very rare options (i.e. Vacuum Ash Tray) making it a highly desirable collectable. The optional dual side exhaust ports located on the quarter panel behind the rear wheels accentuate the sport look. Finished in flawless Rio Red, the Impala was the recipient of the “Carl F. Benz Award” in 2008 at the prestigious Geneva Concours d’Elegance and received the Senior Class 33 award from the Antique Automobile Club of America fall meet in 2007. 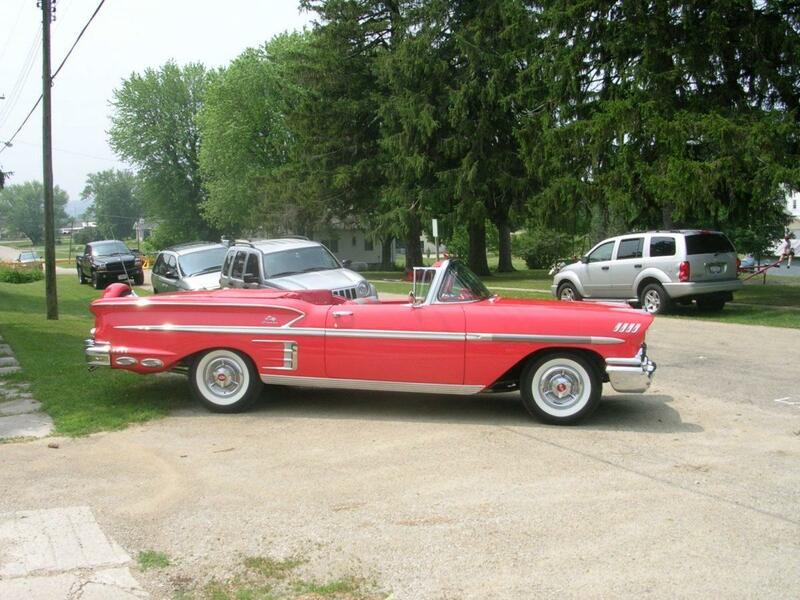 Ken acquired this highly optioned and rare Impala Convertible in 2005 from Bill Oldenburg of Galena, IL. 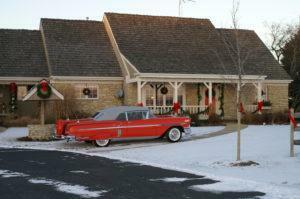 Bill did the complete restoration and for 3 years was his own personal car. Ken heard about the car at a cruize night in Plainfield, IL from Carl Bryant who had a summer home in Galena and knew of the car. Ken got in touch with Bill and after three months of talking about a purchase (Bills main concern was what Ken was going to do with the car) Bill agreed to sell because Ken was going to keep it in his collection and show it. 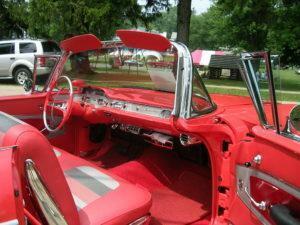 Parts for the ’58 convertibles are expensive and hard to find. 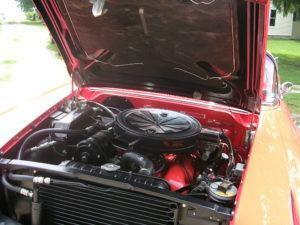 Restoring one to the highest standards is a very costly labor of love. 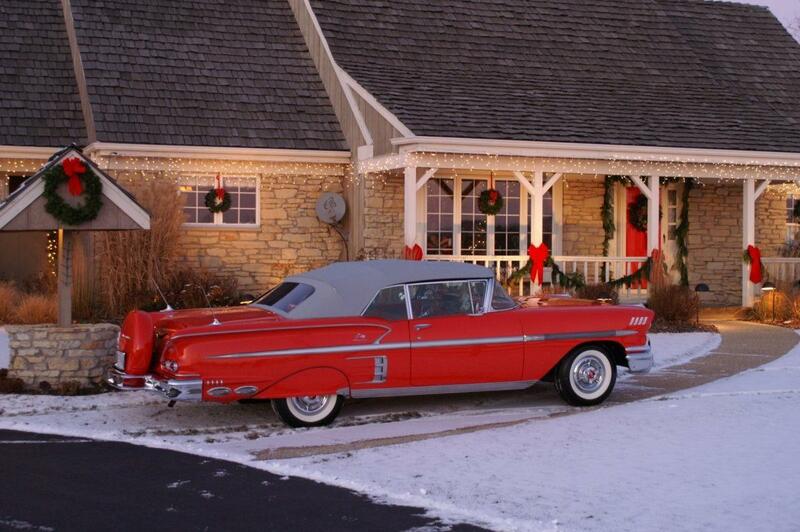 Thanks to Bill’s extraordinary workmanship it is one of the best 1958 Impala’s in the country. The public introduction of the Chevrolet “Impala” name actually took place in 1956 when the one-of-a-kind Impala show car debuted at the General Motors Motorama. The Impala was originally conceived as a Bel Air executive coupe. The sporty four-passenger coupe had a strong Corvette flavor and was referred to as the “Corvette Impala” in some of the motoring press of the time. In 1958 General Motors celebrated its 50th anniversary. This was the first and only year Chevrolet offered the luxury Impala option level on the Bel Air model line. It was the most exciting new shape in a generation of cars! The “Impala” was the only full-size Chevy model to offer a convertible body style for 1958. Production consisted of 43,000 2 door hardtops and 55,989 convertibles 17,000 of which were V8 Impalas (Marit Anne Peterson, Sports Car Market magazine). The number of convertibles still in existence today is unknown. In addition to being lavishly equipped Impalas were soft-riding. Chevy redesigned the chassis into a rugged new “X-frame” that resulted in a new longer lower wider wheelbase featuring coil spring suspension on all four corners. For an even cushier ride an optional Level-Air suspension was available. When it came to get up and go, that’s where the 1958 Chevy really shined. A new 283 cubic inch V8 engine coupled to an automatic transmission with triple-turbines was like nothing seen before. The optional 348 Cu In V8 with 3 2bbl carbs pushed HP to 280, more than enough for spirited performance and effortless cruising. 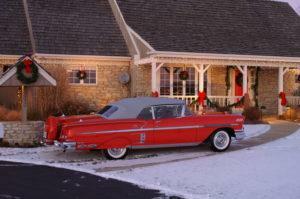 In 1959 the Impala shed its Bel Air affiliation and became its own model. 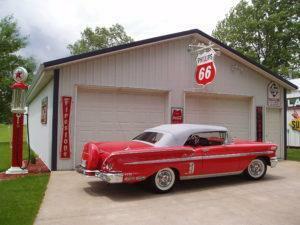 Unfortunately the ’58 styling was scrapped along with the Bel Air designation. The radically restyled 1959 model received a cool reception by the public. For this reason the ’58 Impalas one-year-only styling continued to be more desirable and sought after than ever, a status that it still enjoys today. In spite of 1958 being a recession year, consumers made Chevrolet No.1 and the Impala was at the center of Chevy’s popularity. From 1958 through 1996, Impala sales were in excess of 13 million, more than any other full-size car in the history of the automobile.